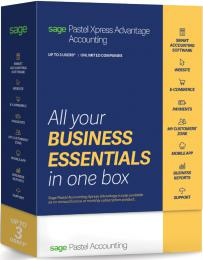 The Sage Pastel Xpress (V18) Accounting package suitable for to small to medium businesses with the need for multi set-s of books / companies.SPECIAL: Pastel Xpress Start-up for only R2 890! Call 082 06 12300 to place your order while stocks last! (Also available with support all inclusive available for R4990 (Retail - R6000) as an add on option and R3000 per year thereafter! ) SPECIAL - SmartBank AND Sage Pastel Xpress Start-up V18 - R 4 790! (Retail R 7890)We also offer you a unique Bank Manager package called SmartBank Bank manager (www.smartbank.co.za) for only R2 400 exta and works beautifully on ALL Pastel Partner/Xpress versions with NO UPGRADE required. Our value added Special Price include free delivery!